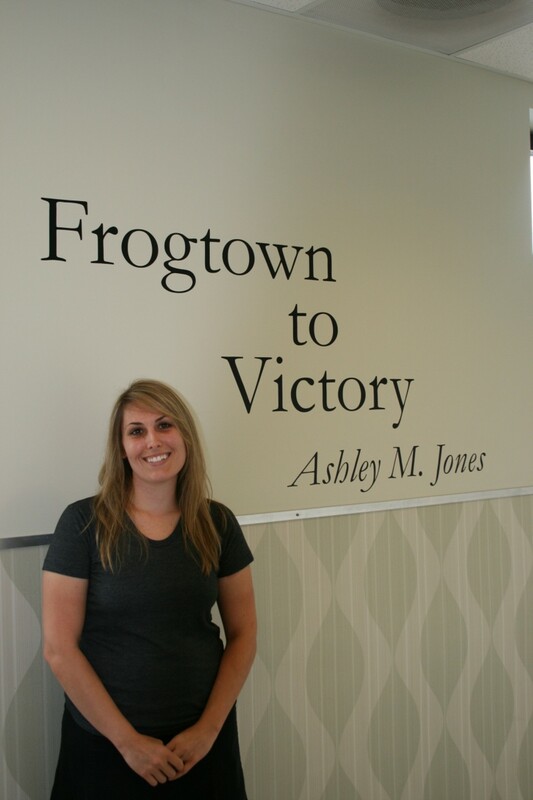 Ashley Jones' Frogtown to Victory is on through Sept. 20 with a closing reception on the 20th at 6 p.m. It is refreshing to see clear signs that Savannah's art scene is being embraced by not only its growing underground network of galleries south of Gaston, and the city, but also by new institutions that value the city's rich well of creative talent. The new Savannah Law School Campus has just opened as a venue for its local artists to exhibit their works, and they do not have to pay for exhibition space. Law professor, and acting gallery coordinator, Andy Wright says, "We intend to be part of the art community in Savannah, and this is one of the reasons we chose a downtown location over a big-box venue on the south side." 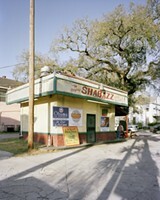 Located on Abercorn at Huntington, the second floor gallery is open to the public with its first show featuring the photographic work of Ashley Jones in an exhibition entitled, Frogtown to Victory, which spotlights the vanishing residential life within the Martin Luther King, Jr. Boulevard corridor (formerly West Broad Street). 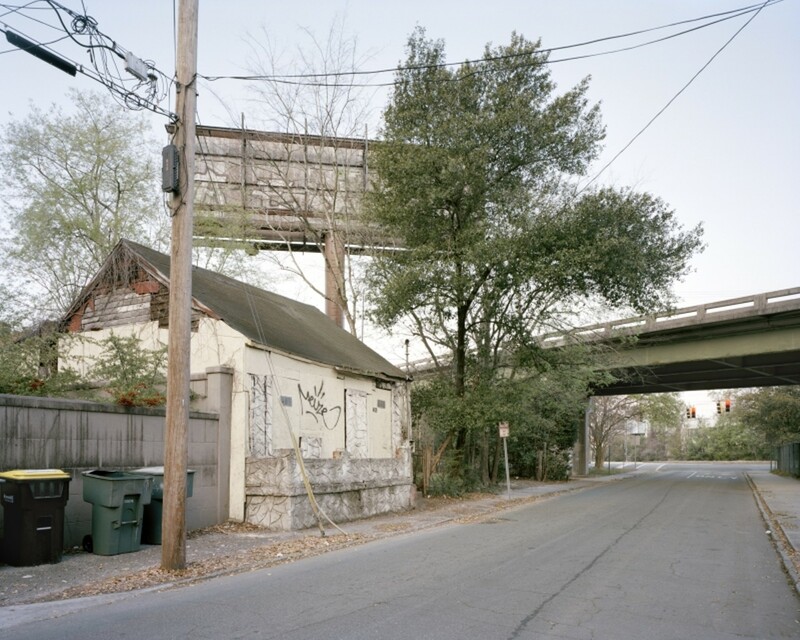 Jones' images portray the blighted urban landscapes within the MLK Boulevard corridor that have succumbed to the intrusion of the Interstate 16 flyover. From boarded-up railroad workers housing in what was known as the "Frogtown" neighborhood, to unsellable houses near Taylor and MLK that have defunct billboards and the interstate overhead, Jones has captured a slice of vanishing life in Savannah. Jones explains, "The mass production and relative affordability of the automobile in the early 20th century resulted in considerable changes to our nation's infrastructure and the need to intersect highway systems with urban neighborhoods. As a resident of Savannah, I am fascinated by the rich history and historic architecture of the city. However, there is a stark division between the restored and legally protected buildings within the central National Historic Landmark District and the struggling, run down neighborhoods that surround it." The works were produced as part of Jones' MFA thesis at SCAD, and she painstakingly researched the diminishing population numbers in the process of the interstate development. Maps she created show 443 houses in 1898 before the development of Union Station; after the Station was erected, a map of 1916 shows 476 houses, when the railroad was thriving; fast forward to 2010, post the interstate, and her map shows 75 houses. 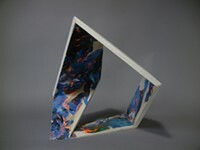 Jones said that Savannah Law School approached her after her thesis exhibition –for which she had to pay, as SCAD's hefty tuition does not include fees for its mandatory MFA exhibitions. 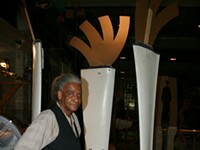 Jones' work accords with the school's dedication to promoting awareness about how the arts communicate Savannah's past, present, and future. Jones' images recall the work of Walker Evans in that they at once capture overlooked living environments, while representing messages in the form of hand painted signage and other visual signals of life in these places. 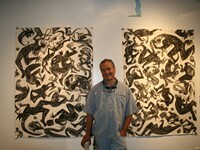 Jones says, "I try to capture the richness of loss and decay as it is happening now. The caged up air-conditioning units in many of the images signify the changed nature of these neighborhoods. When the units were installed in more prosperous times, they were not targets for theft. But now, people are stealing these vintage units to resell copper materials." Perhaps the most disturbing image is of the recently hailed harbinger of hope to the neighborhood along MLK, the Food Lion grocery store near Gwinnett Street. When I moved here two years ago in a nearby neighborhood, all greeted this as a godsend; yet, it was open for less than a year, as the diminished residential population base could not support the store. Her image wryly displays the boarded-up storefront—which looks more fitting for a southside strip mall—with painted ground markers, "Stop" and a directional arrow pointing away from the store next to a handicapped sign. Jones is perhaps on the cutting edge of urban landscape photography in that her images portray the deep issues of contemporary population displacement in the face of urban progress. There are no people in her images. Jones has done her homework, and is an extraordinary watchful eye on what will happen next in this corridor. She claims there is a dialog within the Monument and Parks Commission to remove the ramp of the interstate at MLK Boulevard. The venue itself is well worth a visit and is a stunning example of a private initiative with a public interest. Matthew Kerns, Assistant Director of Admissions explains, "Originally built in 1819, the Candler building has sat mostly vacant since 1980 when the hospital relocated to its current address. Once completed, the renovations will represent one of the largest projects to restore an historic property in the United States. The estimated cost of the renovation is $10 million and is being conducted in partnership with the Historic Review Board and other city planners. As part of the purchase, Savannah Law School is now the owner of the Candler Oak, listed on the National Register of Historic Trees as Georgia's oldest oak tree and has adopted the tree as its logo."